The Peninne Way is a well-known National Trail located mostly in England, but also with a small section in Scotland near the northern terminus. It runs through the Derbyshire Peak District, the Yorkshire Dales, and Northumberland National Park. This route is typically considered more difficult than other long distance trails in the region, and is rated at moderate difficulty. Due to the wet conditions, the terrain is exacerbated with significant amounts of mud amongst hill climbing. So the overall difficulty will depend a lot on the weather conditions during the hike. Much of the route goes through hills and wild moorland, which is common to this part of the country. The terrain will be much less forgiving in poor weather conditions - rain will make for slippery and dangerous climbs. During dry weather the terrain is not particularly difficult - the hills, while challenging, are short in comparison to the tougher climbs associated with many trails. Other parts of the trail will include valleys, exposed ridges, and some paved sections near towns on the trail. The Peninne Way passes through many towns, and so these are excellent places to refill your drinking water. If you have accommodation in town you can fill up there, or otherwise go to a public establishment. Additionally, hikers will often drink less water while hiking in wet conditions. Like most trails, it is recommended to bring some lightweight water system backup in case of emergency. There are many natural water sources on the route to use in that case. 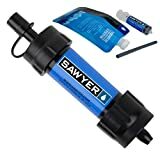 Ultralight water filter weights just two ounces, and includes a 16 ounce pouch. Excellent choice ultralight choice or as a backup system, but the filter speed is somewhat slow. Like other trails in the United Kingdom, the temperature range is generally very pleasant during the primary hiking season, but the conditions tend to also be very wet. Rain is a common constant in this region, though large rainstorms are less frequent, and the rain tends to be lighter and misty. Because of this, much of the accommodation along the route will have dry rooms that can be used to dry out wet gear from the day's hike. On the Peninne Way, most hikers will hike from south to north so that the wind and rain will usually be on their backs. The trail is signposted throughout, but the route will be much more obvious in the upland areas, whereas lowlands will typically be more difficult to navigate. Additionally, wet conditions (especially in high elevations) can reduce visibility significantly, which would make it hard to distinguish both the trail and the signposts on it. Therefore, it is recommended to bring a GPS and/or maps to aid in general navigation. Contains large scale 1:20k maps for the entire route, plus additional information for accommodation, nearby points of interest, walking itineraries, transportation data, and more. The major hazard on this trail is severe weather and related side effects. Rainy conditions often leads to muddy trails, which can become more dangerous to hike. Poor visibility in the mountainous regions can be particularly dangerous, due to difficult navigation in cold, wet conditions. It is crucial to be well-equipped for the worst possible weather in case of emergency. Other minor hazards include insects (midges and clegs) and snakes on the trail. The Peninne Way is one of the most famous and popular trails in the United Kingdom. It is also well suited for long distance hiking because the route has convenient passage through many towns along the way, and the terrain itself is not too challenging for most hikers. Due to these factors, the trail sees much foot traffic during prime hiking season, and accommodation will often get fully booked up. As with most trails, the traffic from day hikers is much higher than that of thru-hikers. Both ends of the trail are easily accessible using public transportation. The Peninne Way starts from Edale, which as a railway station. The northern end of the trail is in Kirk Yethom which has bus service to nearby Kelso, where connections can be made to large public transportation centers. The route itself does pass through many towns with local bus service. However, certain parts of the trail will be more remote, and not easily accessible by road. The route passes through many towns, so that with proper planning you should be able to stay at proper accommodation each night. However, the options vary significantly - there may be hostels, B&Bs, bunkhouses, or nothing at all. There are also four shelters along the trail (bothies) which are useful for providing basic dry shelter. Most hikers will bring a tent along the route, in case accommodation is not readily available (accommodation may be difficult to secure during prime hiking season).